and neuraxial procedures is not known. [see Warnings and Precautions (5.1) and Drug Interactions (7)]. These highlights do not include all the information needed to use Enoxaparin Sodium Injection safely and effectively. 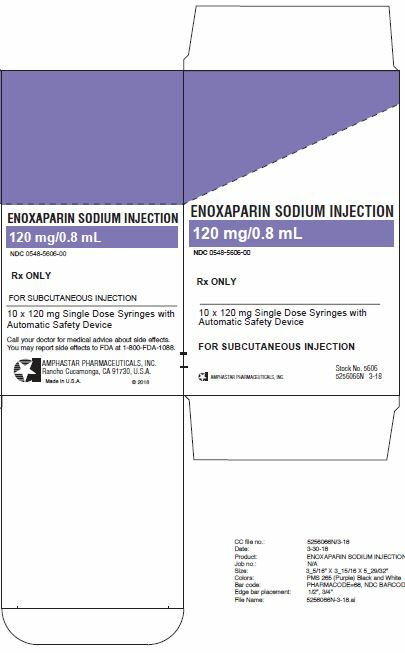 See full prescribing information for Enoxaparin Sodium Injection. Monitor patients frequently for signs and symptoms of neurological impairment. If neurological compromise is noted, urgent treatment is necessary. [see Warnings and Precautions (5.1) and Drug Interactions (7)]. To report SUSPECTED ADVERSE REACTIONS, contact Amphastar Pharmaceuticals, Inc. at 1-800-423-4136 or FDA at 1-800-FDA-1088 or www.fda.gov/medwatch. Discontinue agents which may enhance hemorrhage risk prior to initiation of Enoxaparin Sodium Injection or conduct close clinical and laboratory monitoring (5.9, 7). in patients undergoing abdominal surgery who are at risk for thromboembolic complications [see Clinical Studies 14.1]. in patients undergoing hip replacement surgery, during and following hospitalization. in patients undergoing knee replacement surgery. in medical patients who are at risk for thromboembolic complications due to severely restricted mobility during acute illness. the inpatient treatment of acute deep vein thrombosis with or without pulmonary embolism, when administered in conjunction with warfarin sodium. the outpatient treatment of acute deep vein thrombosis without pulmonary embolism when administered in conjunction with warfarin sodium. 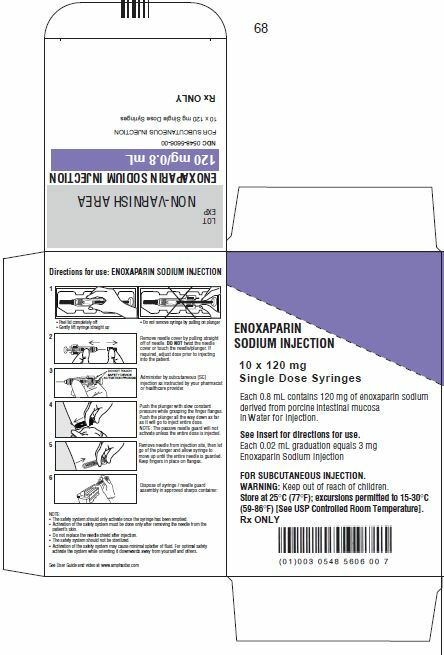 Enoxaparin Sodium Injection, when administered concurrently with aspirin, has been shown to reduce the rate of the combined endpoint of recurrent myocardial infarction or death in patients with acute ST-segment elevation myocardial infarction (STEMI) receiving thrombolysis and being managed medically or with percutaneous coronary intervention (PCI). All patients should be evaluated for a bleeding disorder before administration of Enoxaparin Sodium Injection, unless the medication is needed urgently. Since coagulation parameters are unsuitable for monitoring Enoxaparin Sodium Injection activity, routine monitoring of coagulation parameters is not required [see Warnings and Precautions (5.9)]. For subcutaneous use, Enoxaparin Sodium Injection should not be mixed with other injections or infusions. For intravenous use (i.e., for treatment of acute STEMI), Enoxaparin Sodium Injection can be mixed with normal saline solution (0.9%) or 5% dextrose in water. Enoxaparin Sodium Injection is not intended for intramuscular administration. 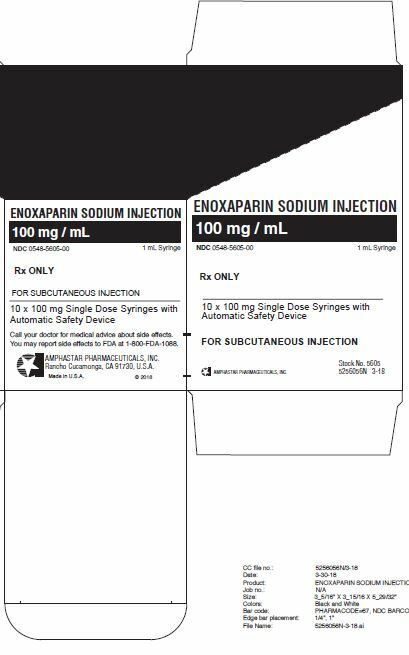 Abdominal Surgery: In patients undergoing abdominal surgery who are at risk for thromboembolic complications, the recommended dose of Enoxaparin Sodium Injection is 40 mg once a day administered by SC injection with the initial dose given 2 hours prior to surgery. The usual duration of administration is 7 to 10 days; up to 12 days administration has been administered in clinical trials. Hip or Knee Replacement Surgery: In patients undergoing hip or knee replacement surgery, the recommended dose of Enoxaparin Sodium Injection is 30 mg every 12 hours administered by SC injection. Provided that hemostasis has been established, the initial dose should be given 12 to 24 hours after surgery. For hip replacement surgery, a dose of 40 mg once a day SC, given initially 12 (±3) hours prior to surgery, may be considered. Following the initial phase of thromboprophylaxis in hip replacement surgery patients, it is recommended that continued prophylaxis with Enoxaparin Sodium Injection 40 mg once a day be administered by SC injection for 3 weeks. The usual duration of administration is 7 to 10 days; up to 14 days administration has been administered in clinical trials. Medical Patients During Acute Illness: In medical patients at risk for thromboembolic complications due to severely restricted mobility during acute illness, the recommended dose of Enoxaparin Sodium Injection is 40 mg once a day administered by SC injection. The usual duration of administration is 6 to 11 days; up to 14 days of Enoxaparin Sodium Injection has been administered in the controlled clinical trial. Treatment of Deep Vein Thrombosis with or without Pulmonary Embolism: In outpatient treatment, patients with acute deep vein thrombosis without pulmonary embolism who can be treated at home, the recommended dose of Enoxaparin Sodium Injection is 1 mg/kg every 12 hours administered SC. 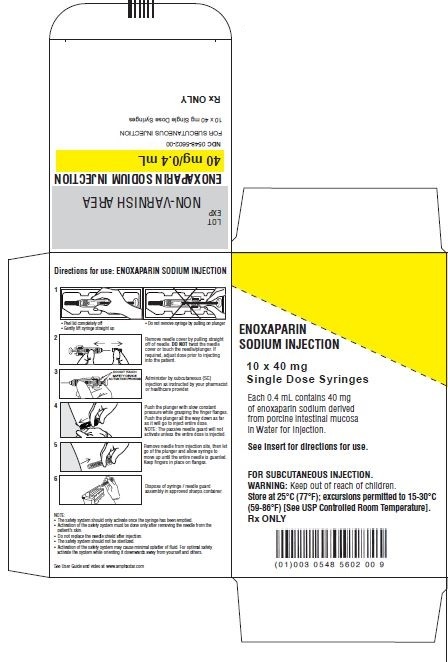 In inpatient (hospital) treatment, patients with acute deep vein thrombosis with pulmonary embolism or patients with acute deep vein thrombosis without pulmonary embolism (who are not candidates for outpatient treatment), the recommended dose of Enoxaparin Sodium Injection is 1 mg/kg every 12 hours administered SC or 1.5 mg/kg once a day administered SC at the same time every day. In both outpatient and inpatient (hospital) treatments, warfarin sodium therapy should be initiated when appropriate (usually within 72 hours of Enoxaparin Sodium Injection). Enoxaparin Sodium Injection should be continued for a minimum of 5 days and until a therapeutic oral anticoagulant effect has been achieved (International Normalization Ratio 2.0 to 3.0). The average duration of administration is 7 days; up to 17 days of Enoxaparin Sodium Injection administration has been administered in controlled clinical trials. Unstable Angina and Non-Q-Wave Myocardial Infarction: In patients with unstable angina or non-Q-wave myocardial infarction, the recommended dose of Enoxaparin Sodium Injection is 1 mg/kg administered SC every 12 hours in conjunction with oral aspirin therapy (100 to 325 mg once daily). Treatment with Enoxaparin Sodium Injection should be prescribed for a minimum of 2 days and continued until clinical stabilization. The usual duration of treatment is 2 to 8 days; up to 12.5 days of Enoxaparin Sodium Injection has been administered in clinical trials [see Warnings and Precautions (5.2) and Clinical Studies (14.5)]. In patients with acute ST-segment elevation myocardial infarction, the recommended dose of Enoxaparin Sodium Injection is a single IV bolus of 30 mg plus a 1 mg/kg SC dose followed by 1 mg/kg administered SC every 12 hours (maximum 100 mg for the first two doses only, followed by 1 mg/kg dosing for the remaining doses). Dosage adjustments are recommended in patients â‰¥75 years of age [see Dosage and Administration (2.3)]. All patients should receive aspirin as soon as they are identified as having STEMI and maintained with 75 to 325 mg once daily unless contraindicated. When administered in conjunction with a thrombolytic (fibrin-specific or non-fibrin specific), Enoxaparin Sodium Injection should be given between 15 minutes before and 30 minutes after the start of fibrinolytic therapy. In the pivotal clinical study, the Enoxaparin Sodium Injection treatment duration was 8 days or until hospital discharge, whichever came first. An optimal duration of treatment is not known, but it is likely to be longer than 8 days. For patients managed with percutaneous coronary intervention (PCI): If the last Enoxaparin Sodium Injection SC administration was given less than 8 hours before balloon inflation, no additional dosing is needed. 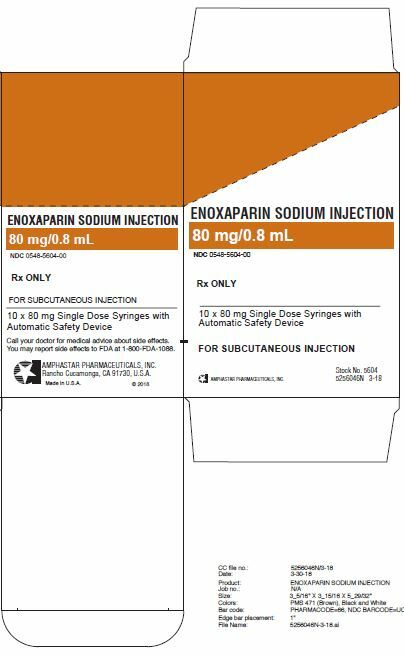 If the last Enoxaparin Sodium Injection SC administration was given more than 8 hours before balloon inflation, an IV bolus of 0.3 mg/kg of Enoxaparin Sodium Injection should be administered [see Warnings and Precautions (5.2)]. Although no dose adjustment is recommended in patients with moderate (creatinine clearance 30â€“50 mL/min) and mild (creatinine clearance 50â€“80 mL/min) renal impairment, all such patients should be observed carefully for signs and symptoms of bleeding. The recommended prophylaxis and treatment dosage regimens for patients with severe renal impairment (creatinine clearance <30 mL/min) are described in Table 1 [see Use in Specific Populations (8.6) and Clinical Pharmacology (12.3)]. For treatment of acute ST-segment elevation myocardial infarction in geriatric patients â‰¥75 years of age, do not use an initial IV bolus. Initiate dosing with 0.75 mg/kg SC every 12 hours (maximum 75 mg for the first two doses only, followed by 0.75 mg/kg dosing for the remaining doses) [see Use in Specific Populations (8.5) and Clinical Phamacology (12.3)]. Enoxaparin Sodium Injection must not be administered by intramuscular injection. 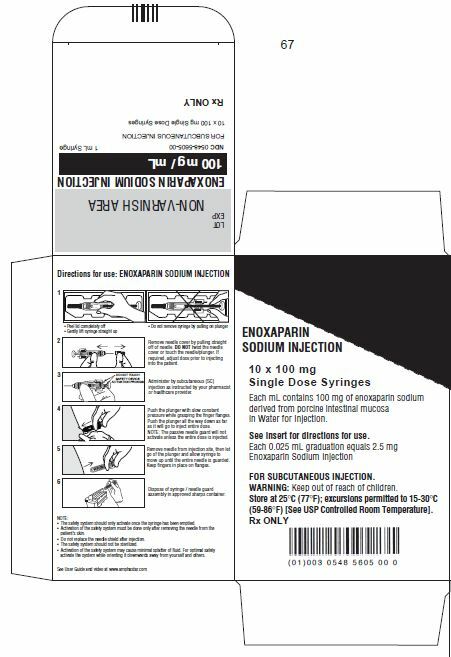 Enoxaparin Sodium Injection is intended for use under the guidance of a physician. Subcutaneous Injection Technique: Patients should be lying down and Enoxaparin Sodium Injection administered by deep SC injection. To avoid the loss of drug when using the 30 and 40 mg prefilled syringes, do not expel the air bubble from the syringe before the injection. Administration should be alternated between the left and right anterolateral and left and right posterolateral abdominal wall. The whole length of the needle should be introduced into a skin fold held between the thumb and forefinger; the skin fold should be held throughout the injection. To minimize bruising, do not rub the injection site after completion of the injection. Remove needle cover by pulling straight off of needle (see Figure 1). If adjusting the dose is required, the adjustment must be done prior to injecting the prescribed dose into the patient. See Administration: Subcutaneous Injection Technique for a description of the Standard Protocol for administration. Depress the plunger while grasping the finger flange until the entire dose has been given. The Passive needle guard should not activate unless the ENTIRE dose has been given. Remove needle from patient, then let go of the plunger and allow syringe to move up until the entire needle is guarded. Dispose of syringe/needle guard assembly in approved sharps container. The safety system should only activate once the syringe has been emptied. Activation of the safety system may cause minimal splatter of fluid. For optimal safety activate the system while orienting it downwards away from yourself and others. For intravenous injection, the multiple-dose vial should be used. Enoxaparin Sodium Injection should be administered through an intravenous line. Enoxaparin Sodium Injection should not be mixed or co-administered with other medications. 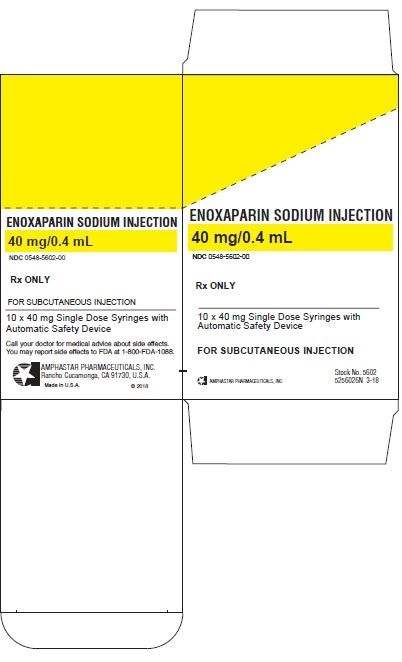 To avoid the possible mixture of Enoxaparin Sodium Injection with other drugs, the intravenous access chosen should be flushed with a sufficient amount of saline or dextrose solution prior to and following the intravenous bolus administration of Enoxaparin Sodium Injection to clear the port of drug. Enoxaparin Sodium Injection may be safely administered with normal saline solution (0.9%) or 5% dextrose in water. Cases of epidural or spinal hemorrhage and subsequent hematomas have been reported with the use of Enoxaparin Sodium Injection and epidural or spinal anesthesia/analgesia or spinal puncture procedures, resulting in long-term or permanent paralysis. The risk of these events is higher with the use of post-operative indwelling epidural catheters, with the concomitant use of additional drugs affecting hemostasis such as NSAIDs, with traumatic or repeated epidural or spinal puncture, or in patients with a history of spinal surgery or spinal deformity [see Boxed Warning, Adverse Reactions (6.2) and Drug Interactions (7)]. 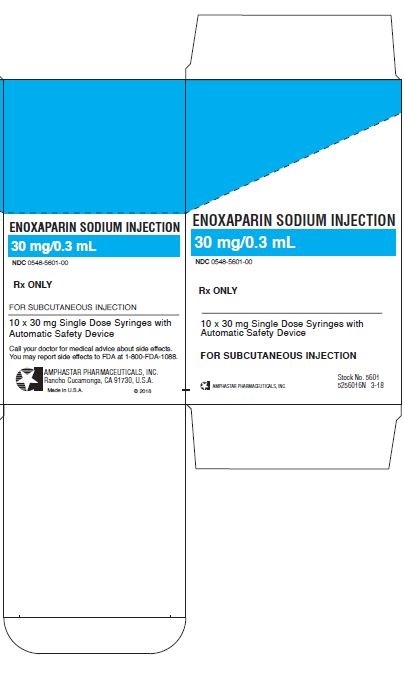 Enoxaparin sodium injection should be used with extreme caution in conditions with increased risk of hemorrhage, such as bacterial endocarditis, congenital or acquired bleeding disorders, active ulcerative and angiodysplastic gastrointestinal disease, hemorrhagic stroke, or shortly after brain, spinal, or ophthalmological surgery, or in patients treated concomitantly with platelet inhibitors. To minimize the risk of bleeding following the vascular instrumentation during the treatment of unstable angina, non-Q-wave myocardial infarction, and acute ST-segment elevation myocardial infarction, adhere precisely to the intervals recommended between enoxaparin sodium injection doses. It is important to achieve hemostasis at the puncture site after PCI. In case a closure device is used, the sheath can be removed immediately. If a manual compression method is used, sheath should be removed 6 hours after the last IV/SC enoxaparin sodium injection. If the treatment with enoxaparin sodium is to be continued, the next scheduled dose should be given no sooner than 6 to 8 hours after sheath removal. The site of the procedure should be observed for signs of bleeding or hematoma formation [see Dosage and Administration (2.1)]. Enoxaparin sodium injection should be used with extreme caution in patients with a history of heparin-induced thrombocytopenia. Thrombocytopenia of any degree should be monitored closely. If the platelet count falls below 100,000/mm3, enoxaparin sodium injection should be discontinued. Cases of heparin-induced thrombocytopenia with thrombosis have also been observed in clinical practice. Some of these cases were complicated by organ infarction, limb ischemia, or death [see Warnings and Precautions (5.4)]. The use of enoxaparin sodium injection for thromboprophylaxis in pregnant women with mechanical prosthetic heart valves has not been adequately studied. In a clinical study of pregnant women with mechanical prosthetic heart valves given enoxaparin (1 mg/kg twice daily) to reduce the risk of thromboembolism, 2 of 8 women developed clots resulting in blockage of the valve and leading to maternal and fetal death. Although a causal relationship has not been established these deaths may have been due to therapeutic failure or inadequate anticoagulation. No patients in the heparin/warfarin group (0 of 4 women) died. There also have been isolated postmarketing reports of valve thrombosis in pregnant women with mechanical prosthetic heart valves while receiving enoxaparin for thromboprophylaxis. Women with mechanical prosthetic heart valves may be at higher risk for thromboembolism during pregnancy, and, when pregnant, have a higher rate of fetal loss from stillbirth, spontaneous abortion and premature delivery. Therefore, frequent monitoring of peak and trough anti-Factor Xa levels, and adjusting of dosage may be needed [see Use in Specific Populations (8.6)]. Periodic complete blood counts, including platelet count, and stool occult blood tests are recommended during the course of treatment with enoxaparin sodium injection. When administered at recommended prophylaxis doses, routine coagulation tests such as Prothrombin Time (PT) and Activated Partial Thromboplastin Time (aPTT) are relatively insensitive measures of enoxaparin sodium injection activity and, therefore, unsuitable for monitoring. Anti-Factor Xa may be used to monitor the anticoagulant effect of enoxaparin sodium injection in patients with significant renal impairment. If during enoxaparin sodium injection therapy abnormal coagulation parameters or bleeding should occur, anti-Factor Xa levels may be used to monitor the anticoagulant effects of enoxaparin sodium injection [see Clinical Pharmacology (12.3)]. During clinical development for the approved indications, 15,918 patients were exposed to enoxaparin sodium. These included 1,228 for prophylaxis of deep vein thrombosis following abdominal surgery in patients at risk for thromboembolic complications, 1,368 for prophylaxis of deep vein thrombosis following hip or knee replacement surgery, 711 for prophylaxis of deep vein thrombosis in medical patients with severely restricted mobility during acute illness, 1,578 for prophylaxis of ischemic complications in unstable angina and non-Q-wave myocardial infarction, 10,176 for treatment of acute ST-elevation myocardial infarction, and 857 for treatment of deep vein thrombosis with or without pulmonary embolism. 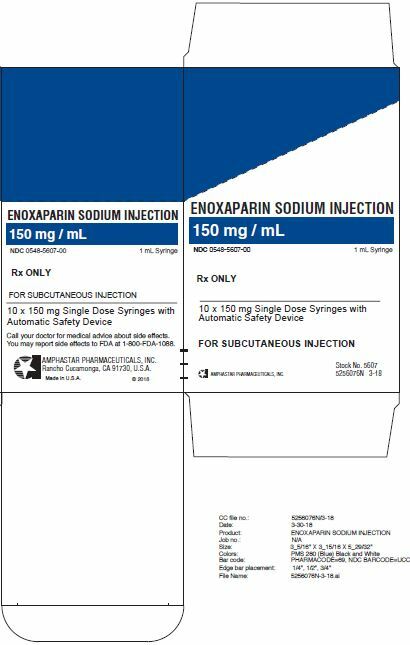 Enoxaparin sodium doses in the clinical trials for prophylaxis of deep vein thrombosis following abdominal or hip or knee replacement surgery or in medical patients with severely restricted mobility during acute illness ranged from 40 mg SC once daily to 30 mg SC twice daily. In the clinical studies for prophylaxis of ischemic complications of unstable angina and non-Q-wave myocardial infarction doses were 1 mg/kg every 12 hours and in the clinical studies for treatment of acute ST-segment elevation myocardial infarction enoxaparin sodium doses were a 30 mg IV bolus followed by 1 mg/kg every 12 hours SC. The incidence of major hemorrhagic complications during enoxaparin sodium injection treatment has been low. The following rates of major bleeding events have been reported during clinical trials with enoxaparin sodium injection [see Tables 2 to 7]. NOTE: At no time point were the 40 mg once a day pre-operative and the 30 mg every 12 hours post-operative hip replacement surgery prophylactic regimens compared in clinical trials. Injection site hematomas during the extended prophylaxis period after hip replacement surgery occurred in 9% of the enoxaparin sodium injection patients versus 1.8% of the placebo patients. • Bleeding complications were considered major: (1) if the hemorrhage caused a significant clinical event, or (2) if accompanied by a hemoglobin decrease â‰¥ 2 g/dL or transfusion of 2 or more units of blood products. Retroperitoneal and intracranial hemorrhages were always considered major. In the knee replacement surgery trials, intraocular hemorrhages were also considered major hemorrhages. • Enoxaparin sodium injection 30 mg every 12 hours SC initiated 12 to 24 hours after surgery and continued for up to 14 days after surgery. • Enoxaparin sodium injection 40 mg SC once a day initiated up to 12 hours prior to surgery and continued for up to 7 days after surgery. • Enoxaparin sodium injection 40 mg SC once a day for up to 21 days after discharge. • Bleeding complications were considered major: (1) if the hemorrhage caused a significant clinical event, (2) if the hemorrhage caused a decrease in hemoglobin of â‰¥ 2 g/dL or transfusion of 2 or more units of blood products. Retroperitoneal and intracranial hemorrhages were always considered major although none were reported during the trial. • Bleeding complications were considered major: (1) if the hemorrhage caused a significant clinical event, or (2) if accompanied by a hemoglobin decrease by â‰¥ 3 g/dL or transfusion of 2 or more units of blood products. Intraocular, retroperitoneal, and intracranial hemorrhages were always considered major. Asymptomatic increases in aspartate (AST [SGOT]) and alanine (ALT [SGPT]) aminotransferase levels greater than three times the upper limit of normal of the laboratory reference range have been reported in up to 6.1% and 5.9% of patients, respectively, during treatment with enoxaparin sodium injection. Similar significant increases in aminotransferase levels have also been observed in patients and healthy volunteers treated with heparin and other low molecular weight heparins. Such elevations are fully reversible and are rarely associated with increases in bilirubin. Since aminotransferase determinations are important in the differential diagnosis of myocardial infarction, liver disease, and pulmonary emboli, elevations that might be caused by drugs like enoxaparin sodium injection should be interpreted with caution. Mild local irritation, pain, hematoma, ecchymosis, and erythema may follow SC injection of enoxaparin sodium injection. 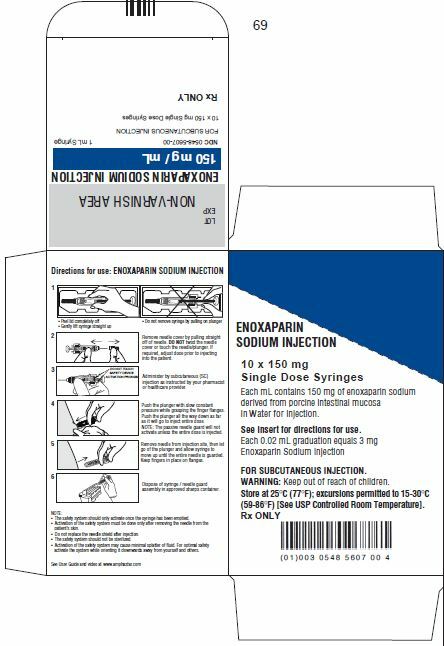 Other adverse reactions that were thought to be possibly or probably related to treatment with enoxaparin sodium injection, heparin, or placebo in clinical trials with patients undergoing hip or knee replacement surgery, abdominal or colorectal surgery, or treatment for DVT and that occurred at a rate of at least 2% in the enoxaparin sodium injection group, are provided below [see Tables 8 to 11]. • Data represent enoxaparin sodium injection 40 mg SC once a day initiated up to 12 hours prior to surgery in 288 hip replacement surgery patients who received enoxaparin sodium injection peri-operatively in an unblinded fashion in one clinical trial. • Data represent enoxaparin sodium injection 40 mg SC once a day given in a blinded fashion as extended prophylaxis at the end of the peri-operative period in 131 of the original 288 hip replacement surgery patients for up to 21 days in one clinical trial. Non-hemorrhagic clinical events reported to be related to enoxaparin sodium injection therapy occurred at an incidence of â‰¤ 1%. Non-major hemorrhagic events, primarily injection site ecchymoses and hematomas, were more frequently reported in patients treated with SC enoxaparin sodium injection than in patients treated with IV heparin. Serious adverse events with enoxaparin sodium injection or heparin in a clinical trial in patients with unstable angina or non-Q-wave myocardial infarction that occurred at a rate of at least 0.5% in the enoxaparin sodium injection group are provided below [see Table 12]. In a clinical trial in patients with acute ST-segment elevation myocardial infarction, the only adverse reaction that occurred at a rate of at least 0.5% in the enoxaparin sodium injection group was thrombocytopenia (1.5%). There have been reports of epidural or spinal hematoma formation with concurrent use of enoxaparin sodium injection and spinal/epidural anesthesia or spinal puncture. The majority of patients had a post-operative indwelling epidural catheter placed for analgesia or received additional drugs affecting hemostasis such as NSAIDs. Many of the epidural or spinal hematomas caused neurologic injury, including long-term or permanent paralysis. Local reactions at the injection site (e.g., nodules, inflammation, oozing), systemic allergic reactions (e.g., pruritus, urticaria, anaphylactic/anaphylactoid reactions), vesiculobullous rash, rare cases of hypersensitivity cutaneous vasculitis, purpura, skin necrosis (occurring at either the injection site or distant from the injection site), thrombocytosis, and thrombocytopenia with thrombosis [see Warnings and Precautions (5.5)] have been reported. Because these reactions are reported voluntarily from a population of uncertain size, it is not possible to estimate reliably their frequency or to establish a causal relationship to drug exposure. Cases of headache, hemorrhagic anemia, eosinophilia, alopecia, hepatolcellular and cholestatic liver injury have been reported. Osteoporosis has also been reported following long-term therapy. Whenever possible, agents which may enhance the risk of hemorrhage should be discontinued prior to initiation of enoxaparin sodium injection therapy. These agents include medications such as: anticoagulants, platelet inhibitors including acetylsalicylic acid, salicylates, NSAIDs (including ketorolac tromethamine), dipyridamole, or sulfinpyrazone. If co-administration is essential, conduct close clinical and laboratory monitoring [see Warnings and Precautions (5.9)]. All pregnancies have a background risk of birth defect, loss, or other adverse outcome regardless of drug exposure. The fetal risk summary below describes the potential of enoxaparin sodium injection to increase the risk of developmental abnormalities above the background risk. Enoxaparin Sodium Injection does not cross the placenta, and is not expected to result in fetal exposure to the drug. Human data from a retrospective cohort study, which included 693 live births, suggest that Enoxaparin Sodium Injection does not increase the risk of major developmental abnormalities. Based on animal data, enoxaparin is not predicted to increase the risk of major developmental abnormalities (see Data). All patients receiving anticoagulants, including pregnant women, are at risk for bleeding. Pregnant women receiving enoxaparin should be carefully monitored for evidence of bleeding or excessive anticoagulation. Consideration for use of a shorter acting anticoagulant should be specifically addressed as delivery approaches [see Boxed Warning]. Hemorrhage can occur at any site and may lead to death of mother and/or fetus. Pregnant women should be apprised of the potential hazard to the fetus and the mother if enoxaparin is administered during pregnancy. Human Data - There are no adequate and well-controlled studies in pregnant women. A retrospective study reviewed the records of 604 women who used enoxaparin during pregnancy. A total of 624 pregnancies resulted in 693 live births. There were 72 hemorrhagic events (11 serious) in 63 women. There were 14 cases of neonatal hemorrhage. Major congenital anomalies in live births occurred at rates (2.5%) similar to background rates. A clinical study using enoxaparin in pregnant women with mechanical prosthetic heart valves has been conducted [see Warnings and Precautions (5.7)]. Animal Data - Teratology studies have been conducted in pregnant rats and rabbits at SC doses of enoxaparin up to 15 times the recommended human dose (by comparison with 2 mg/kg as the maximum recommended daily dose). There was no evidence of teratogenic effects or fetotoxicity due to enoxaparin. Because animal reproduction studies are not always predictive of human response, this drug should be used during pregnancy only if clearly needed. It is not known whether enoxaparin sodium injection is excreted in human milk. 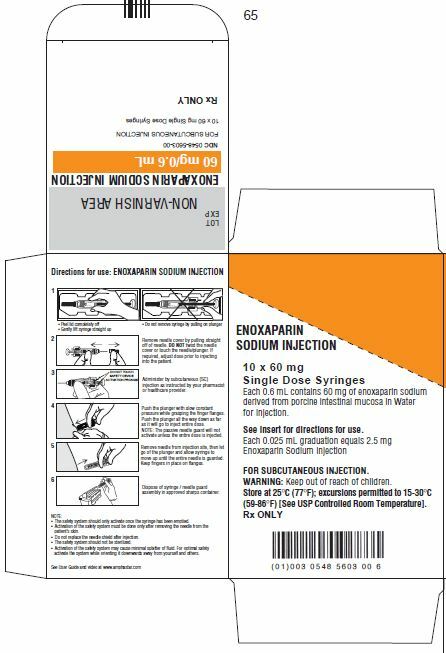 Because many drugs are excreted in human milk and because of the potential for serious adverse reactions in nursing infants from enoxaparin sodium injection, a decision should be made whether to discontinue nursing or discontinue enoxaparin sodium injection, taking into account the importance of enoxaparin sodium injection to the mother and the known benefits of nursing. Over 2800 patients, 65 years and older, have received enoxaparin sodium injection in pivotal clinical trials. The efficacy of enoxaparin sodium injection in the geriatric (â‰¥65 years) was similar to that seen in younger patients (<65 years). The incidence of bleeding complications was similar between geriatric and younger patients when 30 mg every 12 hours or 40 mg once a day doses of enoxaparin sodium injection were employed. The incidence of bleeding complications was higher in geriatric patients as compared to younger patients when enoxaparin sodium injection was administered at doses of 1.5 mg/kg once a day or 1 mg/kg every 12 hours. The risk of enoxaparin sodium injection-associated bleeding increased with age. Serious adverse events increased with age for patients receiving enoxaparin sodium injection. Other clinical experience (including postmarketing surveillance and literature reports) has not revealed additional differences in the safety of enoxaparin sodium injection between geriatric and younger patients. Careful attention to dosing intervals and concomitant medications (especially antiplatelet medications) is advised. Enoxaparin sodium injection should be used with care in geriatric patients who may show delayed elimination of enoxaparin. Monitoring of geriatric patients with low body weight (<45 kg) and those predisposed to decreased renal function should be considered [see Warnings and Precautions (5.9) and Clinical Pharmacology (12.3)]. In the clinical study for treatment of acute ST-segment elevation myocardial infarction, there was no evidence of difference in efficacy between patients â‰¥75 years of age (n = 1241) and patients less than 75 years of age (n = 9015). Patients â‰¥75 years of age did not receive a 30 mg IV bolus prior to the normal dosage regimen and had their SC dose adjusted to 0.75 mg/kg every 12 hours [see Dosage and Administration (2.3)]. The incidence of bleeding complications was higher in patients â‰¥65 years of age as compared to younger patients (<65 years). The use of enoxaparin sodium injection has not been adequately studied for thromboprophylaxis in patients with mechanical prosthetic heart valves and has not been adequately studied for long-term use in this patient population. Isolated cases of prosthetic heart valve thrombosis have been reported in patients with mechanical prosthetic heart valves who have received enoxaparin for thromboprophylaxis. Some of these cases were pregnant women in whom thrombosis led to maternal and fetal deaths. Insufficient data, the underlying disease and the possibility of inadequate anticoagulation complicate the evaluation of these cases. Pregnant women with mechanical prosthetic heart valves may be at higher risk for thromboembolism [see Warnings and Precautions (5.7)]. In patients with renal impairment, there is an increase in exposure of enoxaparin sodium. All such patients should be observed carefully for signs and symptoms of bleeding. Because exposure of enoxaparin sodium is significantly increased in patients with severe renal impairment (creatinine clearance <30 mL/min), a dosage adjustment is recommended for therapeutic and prophylactic dosage ranges. No dosage adjustment is recommended in patients with moderate (creatinine clearance 30â€“50 mL/min) and mild (creatinine clearance 50â€“80 mL/min) renal impairment [see Dosage and Administration (2.2) and Clinical Pharmacology (12.3)]. In patients with renal failure, treatment with enoxaparin has been associated with the development of hyperkalemia [see Adverse Reactions (6.2)]. The impact of hepatic impairment on enoxaparin's exposure and antithrombotic effect has not been investigated. Caution should be exercised when administering enoxaparin to patients with hepatic impairment. An increase in exposure of enoxaparin sodium with prophylactic dosages (non-weight adjusted) has been observed in low-weight women (<45 kg) and low-weight men (<57 kg). All such patients should be observed carefully for signs and symptoms of bleeding [see Clinical Pharmacology (12.3)]. Obese patients are at higher risk for thromboembolism. The safety and efficacy of prophylactic doses of Enoxaparin Sodium Injection in obese patients (BMI >30 kg/m2) has not been fully determined and there is no consensus for dose adjustment. These patients should be observed carefully for signs and symptoms of thromboembolism. Accidental overdosage following administration of enoxaparin sodium injection may lead to hemorrhagic complications. Injected enoxaparin sodium injection may be largely neutralized by the slow IV injection of protamine sulfate (1% solution). The dose of protamine sulfate should be equal to the dose of enoxaparin sodium injection injected: 1 mg protamine sulfate should be administered to neutralize 1 mg enoxaparin sodium injection, if enoxaparin sodium was administered in the previous 8 hours. An infusion of 0.5 mg protamine per 1 mg of enoxaparin sodium may be administered if enoxaparin sodium was administered greater than 8 hours previous to the protamine administration, or if it has been determined that a second dose of protamine is required. The second infusion of 0.5 mg protamine sulfate per 1 mg of enoxaparin sodium injection may be administered if the aPTT measured 2 to 4 hours after the first infusion remains prolonged. Enoxaparin Sodium Injection is a sterile aqueous solution containing enoxaparin sodium, a low molecular weight heparin. The pH of the injection is 5.5 to 7.5. • X = Percent of polysaccharide chain containing 1,6 anhydro derivative on the reducing end. 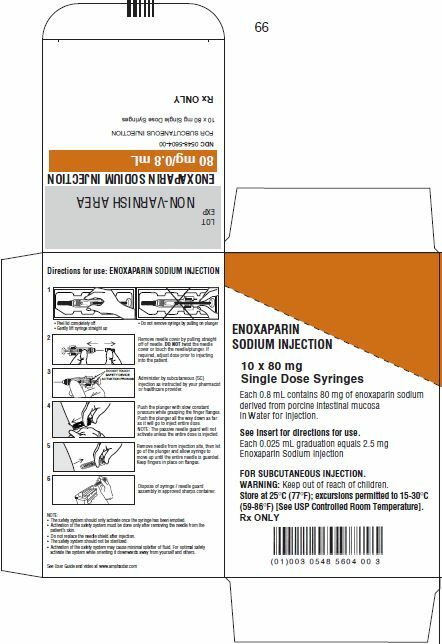 Enoxaparin Sodium Injection 100 mg/mL Concentration contains 10 mg enoxaparin sodium (approximate anti-Factor Xa activity of 1000 IU [with reference to the W.H.O. Second International Low Molecular Weight Heparin Reference Standard]) per 0.1 mL Water for Injection. 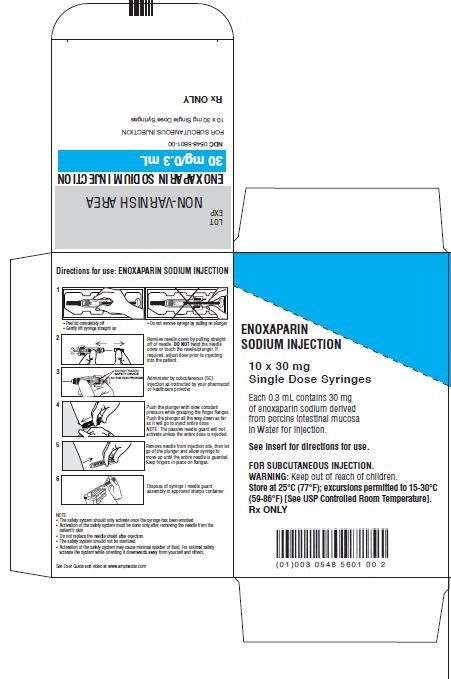 Enoxaparin Sodium Injection 150 mg/mL Concentration contains 15 mg enoxaparin sodium (approximate anti-Factor Xa activity of 1500 IU [with reference to the W.H.O. Second International Low Molecular Weight Heparin Reference Standard]) per 0.1 mL Water for Injection. The Enoxaparin Sodium Injection prefilled syringes and graduated prefilled syringes are preservative-free and intended for use only as a single-dose injection [see Dosage and Administration (2) and How Supplied (16)]. Enoxaparin is a low molecular weight heparin, which has antithrombotic properties. In humans, enoxaparin given at a dose of 1.5 mg/kg subcutaneously (SC) is characterized by a higher ratio of anti-Factor Xa to anti-Factor IIa activity (mean±SD, 14.0±3.1) (based on areas under anti-Factor activity versus time curves) compared to the ratios observed for heparin (mean±SD, 1.22±0.13). Increases of up to 1.8 times the control values were seen in the thrombin time (TT) and the activated partial thromboplastin time (aPTT). Enoxaparin at a 1 mg/kg dose (100 mg/mL concentration), administered SC every 12 hours to patients in a large clinical trial resulted in aPTT values of 45 seconds or less in the majority of patients (n =1607). A 30 mg IV bolus immediately followed by a 1 mg/kg SC administration resulted in aPTT post-injection values of 50 seconds. The average aPTT prolongation value on Day 1 was about 16% higher than on Day 4. Absorption: Pharmacokinetic trials were conducted using the 100 mg/mL formulation. Maximum anti-Factor Xa and anti-thrombin (anti-Factor IIa) activities occur 3 to 5 hours after SC injection of enoxaparin. Mean peak anti-Factor Xa activity was 0.16 IU/mL (1.58 mcg/mL) and 0.38 IU/mL (3.83 mcg/mL) after the 20 mg and the 40 mg clinically tested SC doses, respectively. Mean (n = 46) peak anti-Factor Xa activity was 1.1 IU/mL at steady state in patients with unstable angina receiving 1 mg/kg SC every 12 hours for 14 days. Mean absolute bioavailability of enoxaparin, after 1.5 mg/kg given SC, based on anti-Factor Xa activity is approximately 100% in healthy subjects. A 30 mg IV bolus immediately followed by a 1 mg/kg SC every 12 hours provided initial peak anti-Factor Xa levels of 1.16 IU/mL (n=16) and average exposure corresponding to 84% of steady-state levels. Steady state is achieved on the second day of treatment. Enoxaparin pharmacokinetics appear to be linear over the recommended dosage ranges [see Dosage and Administration (2)]. After repeated subcutaneous administration of 40 mg once daily and 1.5 mg/kg once-daily regimens in healthy volunteers, the steady state is reached on day 2 with an average exposure ratio about 15% higher than after a single dose. Steady-state enoxaparin activity levels are well predicted by single-dose pharmacokinetics. After repeated subcutaneous administration of the 1 mg/kg twice daily regimen, the steady state is reached from day 4 with mean exposure about 65% higher than after a single dose and mean peak and trough levels of about 1.2 and 0.52 IU/mL, respectively. Based on enoxaparin sodium pharmacokinetics, this difference in steady state is expected and within the therapeutic range. Although not studied clinically, the 150 mg/mL concentration of enoxaparin sodium is projected to result in anticoagulant activities similar to those of 100 mg/mL and 200 mg/mL concentrations at the same enoxaparin dose. When a daily 1.5 mg/kg SC injection of enoxaparin sodium was given to 25 healthy male and female subjects using a 100 mg/mL or a 200 mg/mL concentration the following pharmacokinetic profiles were obtained [see Table 13]. Distribution: The volume of distribution of anti-Factor Xa activity is about 4.3 L.
Elimination: Following intravenous (IV) dosing, the total body clearance of enoxaparin is 26 mL/min. After IV dosing of enoxaparin labeled with the gamma-emitter, 99mTc, 40% of radioactivity and 8 to 20% of anti-Factor Xa activity were recovered in urine in 24 hours. Elimination half-life based on anti-Factor Xa activity was 4.5 hours after a single SC dose to about 7 hours after repeated dosing. Significant anti-Factor Xa activity persists in plasma for about 12 hours following a 40 mg SC once a day dose. Following SC dosing, the apparent clearance (CL/F) of enoxaparin is approximately 15 mL/min. Metabolism: Enoxaparin sodium is primarily metabolized in the liver by desulfation and/or depolymerization to lower molecular weight species with much reduced biological potency. Renal clearance of active fragments represents about 10% of the administered dose and total renal excretion of active and non-active fragments 40% of the dose. Gender: Apparent clearance and Amax derived from anti-Factor Xa values following single SC dosing (40 mg and 60 mg) were slightly higher in males than in females. The source of the gender difference in these parameters has not been conclusively identified; however, body weight may be a contributing factor. Geriatric: Apparent clearance and Amax derived from anti-Factor Xa values following single and multiple SC dosing in geriatric subjects were close to those observed in young subjects. Following once a day SC dosing of 40 mg enoxaparin, the Day 10 mean area under anti-Factor Xa activity versus time curve (AUC) was approximately 15% greater than the mean Day 1 AUC value [see Dosage and Administration (2.3) and Use in Specific Populations (8.5)]. Renal Impairment: A linear relationship between anti-Factor Xa plasma clearance and creatinine clearance at steady state has been observed, which indicates decreased clearance of enoxaparin sodium in patients with reduced renal function. Anti-Factor Xa exposure represented by AUC, at steady state, is marginally increased in mild (creatinine clearance 50â€“80 mL/min) and moderate (creatinine clearance 30â€“50 mL/min) renal impairment after repeated subcutaneous 40 mg once-daily doses. In patients with severe renal impairment (creatinine clearance <30 mL/min), the AUC at steady state is significantly increased on average by 65% after repeated subcutaneous 40 mg once-daily doses [see Dosage and Administration (2.2) and Use in Specific Populations (8.7)]. Hemodialysis: In a single study, elimination rate appeared similar but AUC was two-fold higher than control population, after a single 0.25 or 0.5 mg/kg intravenous dose. Hepatic Impairment: Studies with enoxaparin in patients with hepatic impairment have not been conducted and the impact of hepatic impairment on the exposure to enoxaparin is unknown [see Use in Specific Populations (8.8)]. Weight: After repeated subcutaneous 1.5 mg/kg once daily dosing, mean AUC of anti-Factor Xa activity is marginally higher at steady-state in obese healthy volunteers (BMI 30â€“48 kg/m2) compared to non-obese control subjects, while Amax is not increased. When non-weight adjusted dosing was administered, it was found after a single-subcutaneous 40 mg dose, that anti-Factor Xa exposure is 52% higher in low-weight women (<45 kg) and 27% higher in low-weight men (< 57 kg) when compared to normal weight control subjects [see Use in Specific Populations (8.9)]. Pharmacokinetic interaction: No pharmacokinetic interaction was observed between enoxaparin and thrombolytics when administered concomitantly. No long-term studies in animals have been performed to evaluate the carcinogenic potential of enoxaparin. Enoxaparin was not mutagenic in in vitro tests, including the Ames test, mouse lymphoma cell forward mutation test, and human lymphocyte chromosomal aberration test, and the in vivo rat bone marrow chromosomal aberration test. Enoxaparin was found to have no effect on fertility or reproductive performance of male and female rats at SC doses up to 20 mg/kg/day or 141 mg/m2/day. The maximum human dose in clinical trials was 2.0 mg/kg/day or 78 mg/m2/day (for an average body weight of 70 kg, height of 170 cm, and body surface area of 1.8 m2). A single SC dose of 46.4 mg/kg enoxaparin was lethal to rats. The symptoms of acute toxicity were ataxia, decreased motility, dyspnea, cyanosis, and coma. Teratology studies have been conducted in pregnant rats and rabbits at SC doses of enoxaparin up to 30 mg/kg/day corresponding to 211 mg/m2/day and 410 mg/m2/day in rats and rabbits respectively. There was no evidence of teratogenic effects or fetotoxicity due to enoxaparin. In a double-blind, parallel group study of patients undergoing elective cancer surgery of the gastrointestinal, urological, or gynecological tract, a total of 1116 patients were enrolled in the study, and 1115 patients were treated. Patients ranged in age from 32 to 97 years (mean age 67 years) with 52.7% men and 47.3% women. Patients were 98% Caucasian, 1.1% Black, 0.4% Asian, and 0.4% others. Enoxaparin sodium injection 40 mg SC, administered once a day, beginning 2 hours prior to surgery and continuing for a maximum of 12 days after surgery, was comparable to heparin 5000 U every 8 hours SC in reducing the risk of DVT. The efficacy data are provided below [see Table 14]. In a second double-blind, parallel group study, enoxaparin sodium injection 40 mg SC once a day was compared to heparin 5000 U every 8 hours SC in patients undergoing colorectal surgery (one-third with cancer). A total of 1347 patients were randomized in the study and all patients were treated. Patients ranged in age from 18 to 92 years (mean age 50.1 years) with 54.2% men and 45.8% women. Treatment was initiated approximately 2 hours prior to surgery and continued for approximately 7 to 10 days after surgery. The efficacy data are provided below [see Table 15]. Enoxaparin sodium injection has been shown to reduce the risk of post-operative deep vein thrombosis (DVT) following hip or knee replacement surgery. In a double-blind study, enoxaparin sodium injection 30 mg every 12 hours SC was compared to placebo in patients with hip replacement. A total of 100 patients were randomized in the study and all patients were treated. Patients ranged in age from 41 to 84 years (mean age 67.1 years) with 45% men and 55% women. After hemostasis was established, treatment was initiated 12 to 24 hours after surgery and was continued for 10 to 14 days after surgery. The efficacy data are provided below [see Table 16]. A double-blind, multicenter study compared three dosing regimens of enoxaparin sodium injection in patients with hip replacement. A total of 572 patients were randomized in the study and 568 patients were treated. Patients ranged in age from 31 to 88 years (mean age 64.7 years) with 63% men and 37% women. Patients were 93% Caucasian, 6% Black, < 1% Asian, and 1% others. Treatment was initiated within two days after surgery and was continued for 7 to 11 days after surgery. The efficacy data are provided below [see Table 17]. There was no significant difference between the 30 mg every 12 hours and 40 mg once a day regimens. In a double-blind study, enoxaparin sodium injection 30 mg every 12 hours SC was compared to placebo in patients undergoing knee replacement surgery. A total of 132 patients were randomized in the study and 131 patients were treated, of which 99 had total knee replacement and 32 had either unicompartmental knee replacement or tibial osteotomy. The 99 patients with total knee replacement ranged in age from 42 to 85 years (mean age 70.2 years) with 36.4% men and 63.6% women. After hemostasis was established, treatment was initiated 12 to 24 hours after surgery and was continued up to 15 days after surgery. The incidence of proximal and total DVT after surgery was significantly lower for enoxaparin sodium injection compared to placebo. The efficacy data are provided below [see Table 18]. Additionally, in an open-label, parallel group, randomized clinical study, enoxaparin sodium injection 30 mg every 12 hours SC in patients undergoing elective knee replacement surgery was compared to heparin 5000 U every 8 hours SC. A total of 453 patients were randomized in the study and all were treated. Patients ranged in age from 38 to 90 years (mean age 68.5 years) with 43.7% men and 56.3% women. Patients were 92.5% Caucasian, 5.3% Black, and 0.6% others. Treatment was initiated after surgery and continued up to 14 days. The incidence of deep vein thrombosis was significantly lower for enoxaparin sodium injection compared to heparin. Extended Prophylaxis of Deep Vein Thrombosis Following Hip Replacement Surgery: In a study of extended prophylaxis for patients undergoing hip replacement surgery, patients were treated, while hospitalized, with enoxaparin sodium injection 40 mg SC, initiated up to 12 hours prior to surgery for the prophylaxis of post-operative DVT. At the end of the peri-operative period, all patients underwent bilateral venography. In a double-blind design, those patients with no venous thromboembolic disease were randomized to a post-discharge regimen of either enoxaparin sodium injection 40 mg (n = 90) once a day SC or to placebo (n = 89) for 3 weeks. A total of 179 patients were randomized in the double-blind phase of the study and all patients were treated. Patients ranged in age from 47 to 87 years (mean age 69.4 years) with 57% men and 43% women. In this population of patients, the incidence of DVT during extended prophylaxis was significantly lower for enoxaparin sodium injection compared to placebo. The efficacy data are provided below [see Table 19]. In a second study, patients undergoing hip replacement surgery were treated, while hospitalized, with enoxaparin sodium injection 40 mg SC, initiated up to 12 hours prior to surgery. All patients were examined for clinical signs and symptoms of venous thromboembolic (VTE) disease. In a double-blind design, patients without clinical signs and symptoms of VTE disease were randomized to a post-discharge regimen of either enoxaparin sodium injection 40 mg (n = 131) once a day SC or to placebo (n = 131) for 3 weeks. A total of 262 patients were randomized in the study double-blind phase and all patients were treated. Patients ranged in age from 44 to 87 years (mean age 68.5 years) with 43.1% men and 56.9% women. Similar to the first study the incidence of DVT during extended prophylaxis was significantly lower for enoxaparin sodium injection compared to placebo, with a statistically significant difference in both total DVT (enoxaparin sodium injection 21 [16%] versus placebo 45 [34%]; p = 0.001) and proximal DVT (enoxaparin sodium injection 8 [6%] versus placebo 28 [21%]; p = <0.001). In a double blind multicenter, parallel group study, enoxaparin sodium injection 20 mg or 40 mg once a day SC was compared to placebo in the prophylaxis of deep vein thrombosis (DVT) in medical patients with severely restricted mobility during acute illness (defined as walking distance of <10 meters for â‰¤3 days). This study included patients with heart failure (NYHA Class III or IV); acute respiratory failure or complicated chronic respiratory insufficiency (not requiring ventilatory support): acute infection (excluding septic shock); or acute rheumatic disorder [acute lumbar or sciatic pain, vertebral compression (due to osteoporosis or tumor), acute arthritic episodes of the lower extremities]. A total of 1102 patients were enrolled in the study, and 1073 patients were treated. Patients ranged in age from 40 to 97 years (mean age 73 years) with equal proportions of men and women. Treatment continued for a maximum of 14 days (median duration 7 days). When given at a dose of 40 mg once a day SC, enoxaparin sodium injection significantly reduced the incidence of DVT as compared to placebo. The efficacy data are provided below [see Table 20]. At approximately 3 months following enrollment, the incidence of venous thromboembolism remained significantly lower in the enoxaparin sodium injection 40 mg treatment group versus the placebo treatment group. In a multicenter, parallel group study, 900 patients with acute lower extremity deep vein thrombosis (DVT) with or without pulmonary embolism (PE) were randomized to an inpatient (hospital) treatment of either (i) enoxaparin sodium injection 1.5 mg/kg once a day SC, (ii) enoxaparin sodium injection 1 mg/kg every 12 hours SC, or (iii) heparin IV bolus (5000 IU) followed by a continuous infusion (administered to achieve an aPTT of 55 to 85 seconds). A total of 900 patients were randomized in the study and all patients were treated. Patients ranged in age from 18 to 92 years (mean age 60.7 years) with 54.7% men and 45.3% women. All patients also received warfarin sodium (dose adjusted according to PT to achieve an International Normalization Ratio [INR] of 2.0 to 3.0), commencing within 72 hours of initiation of enoxaparin sodium injection or standard heparin therapy, and continuing for 90 days. Enoxaparin sodium injection or standard heparin therapy was administered for a minimum of 5 days and until the targeted warfarin sodium INR was achieved. Both enoxaparin sodium injection regimens were equivalent to standard heparin therapy in reducing the risk of recurrent venous thromboembolism (DVT and/or PE). The efficacy data are provided below [see Table 21]. • The 95% Confidence Intervals for the treatment differences for total VTE were: enoxaparin sodium injection once a day versus heparin (-3.0 to 3.5) enoxaparin sodium injection every 12 hours versus heparin (-4.2 to 1.7). Similarly, in a multicenter, open-label, parallel group study, patients with acute proximal DVT were randomized to enoxaparin sodium injection or heparin. Patients who could not receive outpatient therapy were excluded from entering the study. Outpatient exclusion criteria included the following: inability to receive outpatient heparin therapy because of associated co-morbid conditions or potential for non-compliance and inability to attend follow-up visits as an outpatient because of geographic inaccessibility. Eligible patients could be treated in the hospital, but ONLY enoxaparin sodium injection patients were permitted to go home on therapy (72%). A total of 501 patients were randomized in the study and all patients were treated. Patients ranged in age from 19 to 96 years (mean age 57.8 years) with 60.5% men and 39.5% women. Patients were randomized to either enoxaparin sodium injection 1 mg/kg every 12 hours SC or heparin IV bolus (5000 IU) followed by a continuous infusion administered to achieve an aPTT of 60 to 85 seconds (in-patient treatment). All patients also received warfarin sodium as described in the previous study. Enoxaparin sodium injection or standard heparin therapy was administered for a minimum of 5 days. Enoxaparin sodium injection was equivalent to standard heparin therapy in reducing the risk of recurrent venous thromboembolism. The efficacy data are provided below [see Table 22]. In a multicenter, double-blind, parallel group study, patients who recently experienced unstable angina or non-Q-wave myocardial infarction were randomized to either enoxaparin sodium injection 1 mg/kg every 12 hours SC or heparin IV bolus (5000 U) followed by a continuous infusion (adjusted to achieve an aPTT of 55 to 85 seconds). A total of 3171 patients were enrolled in the study, and 3107 patients were treated. Patients ranged in age from 25â€“94 years (median age 64 years), with 33.4% of patients female and 66.6% male. Race was distributed as follows: 89.8% Caucasian, 4.8% Black, 2.0% Asian, and 3.5% other. All patients were also treated with aspirin 100 to 325 mg per day. Treatment was initiated within 24 hours of the event and continued until clinical stabilization, revascularization procedures, or hospital discharge, with a maximal duration of 8 days of therapy. The combined incidence of the triple endpoint of death, myocardial infarction, or recurrent angina was lower for enoxaparin sodium injection compared with heparin therapy at 14 days after initiation of treatment. The lower incidence of the triple endpoint was sustained up to 30 days after initiation of treatment. These results were observed in an analysis of both all-randomized and all-treated patients. The efficacy data are provided below [see Table 23]. • Evaluation timepoints are after initiation of treatment. Therapy continued for up to 8 days (median duration of 2.6 days). The combined incidence of death or myocardial infarction at all time points was lower for enoxaparin sodium injection compared to standard heparin therapy, but did not achieve statistical significance. The efficacy data are provided below [see Table 24]. In a multicenter, double-blind, double-dummy, parallel group study, patients with acute ST-segment elevation myocardial infarction (STEMI) who were to be hospitalized within 6 hours of onset and were eligible to receive fibrinolytic therapy were randomized in a 1:1 ratio to receive either enoxaparin sodium injection or unfractionated heparin. Study medication was initiated between 15 minutes before and 30 minutes after the initiation of fibrinolytic therapy. Unfractionated heparin was administered beginning with an IV bolus of 60 U/kg (maximum 4000 U) and followed with an infusion of 12 U/kg per hour (initial maximum 1000 U per hour) that was adjusted to maintain an aPTT of 1.5 to 2 times the control value. The IV infusion was to be given for at least 48 hours. The enoxaparin dosing strategy was adjusted according to the patient's age and renal function. For patients younger than 75 years of age, enoxaparin was given as a single 30 mg intravenous bolus plus a 1 mg/kg SC dose followed by an SC injection of 1 mg/kg every 12 hours. For patients at least 75 years of age, the IV bolus was not given and the SC dose was reduced to 0.75 mg/kg every 12 hours. For patients with severe renal insufficiency (estimated creatinine clearance of less than 30 mL per minute), the dose was to be modified to 1 mg/kg every 24 hours. The SC injections of enoxaparin were given until hospital discharge or for a maximum of eight days (whichever came first). The mean treatment duration for enoxaparin was 6.6 days. The mean treatment duration of unfractionated heparin was 54 hours. When percutaneous coronary intervention was performed during study medication period, patients received antithrombotic support with blinded study drug. For patients on enoxaparin, the PCI was to be performed on enoxaparin (no switch) using the regimen established in previous studies, i.e. no additional dosing, if the last SC administration was less than 8 hours before balloon inflation, IV bolus of 0.3 mg/kg enoxaparin if the last SC administration was more than 8 hours before balloon inflation. Among 20,479 patients in the ITT population, the mean age was 60 years, and 76% were male. Racial distribution was: 87% Caucasian, 9.8% Asian, 0.2% Black, and 2.8% other. Medical history included previous MI (13%), hypertension (44%), diabetes (15%) and angiographic evidence of CAD (5%). Concomitant medication included aspirin (95%), beta- blockers (86%), ACE inhibitors (78%), statins (70%) and clopidogrel (27%). The MI at entry was anterior in 43%, non-anterior in 56%, and both in 1%. The primary efficacy end point was the composite of death from any cause or myocardial re-infarction in the first 30 days after randomization. Total follow-up was one year. 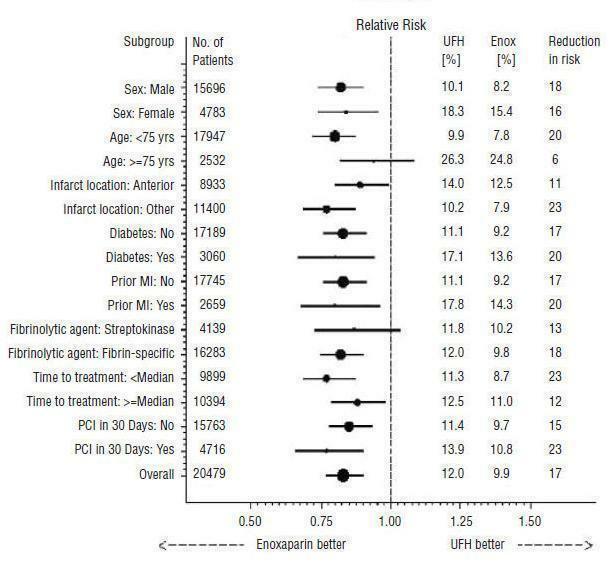 The rate of the primary efficacy end point (death or myocardial re-infarction) was 9.9% in the enoxaparin group, and 12.0% in the unfractionated heparin group, a 17% reduction in the relative risk, (P=0.000003) [see Table 25]. The beneficial effect of enoxaparin on the primary end point was consistent across key subgroups including age, gender, infarct location, history of diabetes, history of prior myocardial infarction, fibrinolytic agent administered, and time to treatment with study drug (see Figure 1); however, it is necessary to interpret such subgroup analyses with caution. • The primary efficacy end point was the composite of death from any cause or myocardial re-infarction in the first 30 days. The overall treatment effect of enoxaparin as compared to the unfractionated heparin is shown at the bottom of the figure. For each subgroup, the circle is proportional to the number and represents the point estimate of the treatment effect and the horizontal lines represent the 95 percent confidence intervals. Fibrin-specific fibrinolytic agents included alteplase, tenecteplase and reteplase. Time to treatment indicates the time from the onset of symptoms to the administration of study drug (median, 3.2 hours). The beneficial effect of enoxaparin on the primary end point observed during the first 30 days was maintained over a 12 month follow-up period (see Figure 2). There is a trend in favor of enoxaparin during the first 48 hours, but most of the treatment difference is attributed to a step increase in the event rate in the UFH group at 48 hours (seen in Figure 2), an effect that is more striking when comparing the event rates just prior to and just subsequent to actual times of discontinuation. These results provide evidence that UFH was effective and that it would be better if used longer than 48 hours. There is a similar increase in endpoint event rate when enoxaparin was discontinued, suggesting that it too was discontinued too soon in this study. The rates of major hemorrhages (defined as requiring 5 or more units of blood for transfusion, or 15% drop in hematocrit or clinically overt bleeding, including intracranial hemorrhage) at 30 days were 2.1% in the enoxaparin group and 1.4% in the unfractionated heparin group. The rates of intracranial hemorrhage at 30 days were 0.8% in the enoxaparin group 0.7% in the unfractionated heparin group. 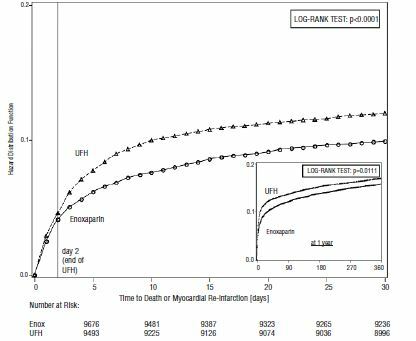 The 30-day rate of the composite endpoint of death, myocardial re-infarction or ICH (a measure of net clinical benefit) was significantly lower in the enoxaparin group (10.1%) as compared to the heparin group (12.2%). • Strength represents the number of milligrams of enoxaparin sodium in Water for Injection. Enoxaparin Sodium Injection, 30 and 40 mg prefilled syringes, and 60, 80, and 100 mg graduated prefilled syringes each contain 10 mg enoxaparin sodium per 0.1 mL Water for Injection. • Approximate anti-Factor Xa activity based on reference to the W.H.O. Second International Low Molecular Weight Heparin Reference Standard. • Each Enoxaparin Sodium Injection prefilled syringe is for single, one-time use only and is affixed with a 27 gauge × 1/2 inch needle. • Strength represents the number of milligrams of enoxaparin sodium in Water for Injection. Enoxaparin Sodium Injection 120 and 150 mg graduated prefilled syringes contain 15 mg enoxaparin sodium per 0.1 mL Water for Injection. • Each Enoxaparin Sodium Injection graduated prefilled syringe is for single, one-time use only and is affixed with a 27 gauge × 1/2 inch needle. If patients have had neuraxial anesthesia or spinal puncture, and particularly, if they are taking concomitant NSAIDs, platelet inhibitors, or other anticoagulants, they should be informed to watch for signs and symptoms of spinal or epidural hematoma, such as tingling, numbness (especially in the lower limbs) and muscular weakness. If any of these symptoms occur the patient should contact his or her physician immediately. Additionally, the use of aspirin and other NSAID's may enhance the risk of hemorrhage. Their use should be discontinued prior to enoxaparin therapy whenever possible; if co-administration is essential, the patient's clinical and laboratory status should be closely monitored [see Drug Interactions (7)]. of the instructions for injecting Enoxaparin Sodium Injection if their therapy is to continue after discharge from the hospitals. they may bruise and/or bleed more easily when they are treated with Enoxaparin Sodium Injection. they should report any unusual bleeding, bruising, or signs of thrombocytopenia (such as a rash of dark red spots under the skin) to their physician [see Warnings and Precautions (5.1, 5.5)]. 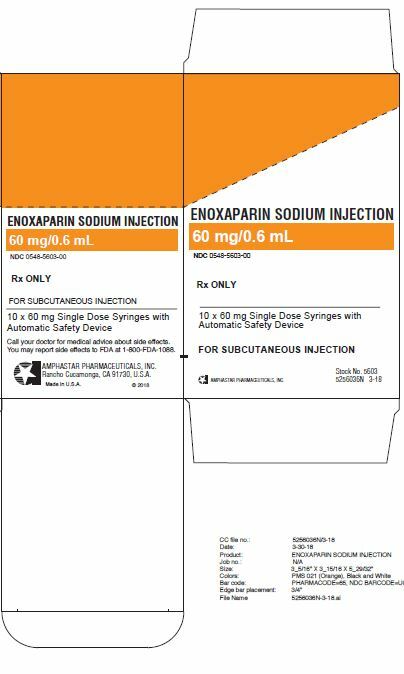 to tell their physicians and dentists they are taking Enoxaparin Sodium Injection and/or any other product known to affect bleeding before any surgery is scheduled and before any new drug is taken [see Warnings and Precautions (5.3)]. to tell their physicians and dentists of all medications they are taking, including those obtained without a prescription, such as aspirin or other NSAID's [see Drug Interactions (7)]. Rancho Cucamonga, CA 91730, U.S.A.
Each 0.3 mL contains 30 mg of enoxaparin sodium derived from pocrine intestinal mucosa in Water for Injection. See insert for directions for use. Store at 25°C (77°F); excursions permitted 15-30°C (59-86°F) [See USP Controlled Room Temperature]. Each 0.4 mL contains 40 mg of enoxaparin sodium derived from pocrine intestinal mucosa in Water for Injection. See insert for directions for use. Each 0.6 mL contains 60 mg of enoxaparin sodium derived from porcine intestinal mucosa in Water for Injection. See insert for directions for use. Each 0.8 mL contains 80 mg of enoxaparin sodium derived from porcine intestinal mucosa in Water for Injection. See insert for directions for use. Each mL contains 100 mg of enoxaparin sodium derived from porcine intestinal mucosa in Water for Injection. See insert for directions for use. Each 0.8 mL contains 120 mg of enoxaparin sodium derived from porcine intestinal mucosa in Water for Injection. See insert for directions for use. Each mL contains 150 mg of enoxaparin sodium derived from porcine intestinal mucosa in Water for Injection. See insert for directions for use.